The results of a handful of Geekbench stress tests are already available via Primate Labs' Geekbench Browser, showcasing the power of the ultra-low-voltage Intel Core i5-4260U chip powering both the new 11- and 13-inch MacBook Air models. 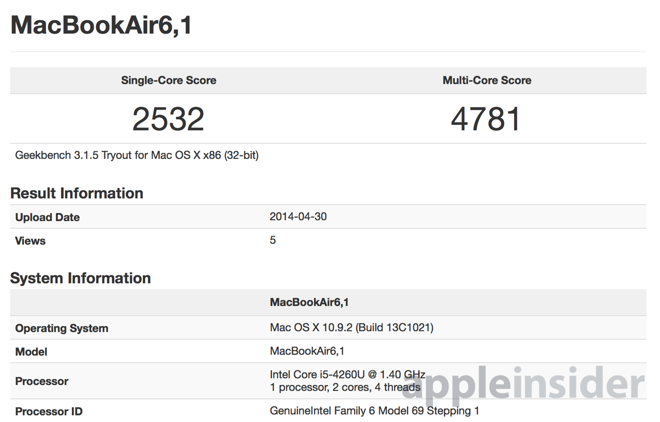 Clocked at 1.4 gigahertz, the chip pushed the 32-bit Geekbench single-core score for the MacBook Air in one test to 2,532, while the multi-core score reached 4,781. In comparison, last year's MacBook Air was powered by the Intel Core i5-4250U clocked slightly slower, at 1.3 gigahertz. It earned a single-core 32-bit Geekbench score of 2,461 in one recent test, and a multi-core score of 4,615. The scores show that the minor megahertz bump found in the new MacBook Air models results in relatively small but still measurable gains for the 2014 refresh. The Geekbench scores show that multi-core performance in both integer and floating point tests were improved from last year, while single-core tests in those categories, as well as memory performance, are essentially the same from 2013 to 2014. Reflecting how minor the changes are, Primate Labs founder John Poole noted to AppleInsider that Apple did not update the model identifier for the new 2014 MacBook Airs. Beyond the base chip tested in these results, Apple does offer a build-to-order option for its latest MacBook Air models, bumping the CPU performance up to a 1.7-gigahertz Core i7 model. That upgrade carries a $150 premium. Both the 2013 and 2014 MacBook Air models are so similar because they both rely on chips utilizing Intel's Haswell architecture. The chipmaker's next-generation processors, known as Broadwell, were originally planned to arrive earlier this year, but recent rumors have suggested that computers featuring Broadwell chips may not arrive until early 2015. A more significant upgrade to the MacBook Air lineup is rumored to arrive later this year, with a newly designed 12-inch version featuring a high-resolution Retina display rumored to arrive in late 2014. Analyst Ming-Chi Kuo of KGI Securities has said the new MacBook Air with Retina display will feature a fan-less design with fewer inputs and outputs, and a new click-less trackpad.